There are nearly 1 million hernia surgeries performed each year in the US1. It is important for both patients and health care professionals to have the most complete and current information available. Each link contains information to help you make important decisions regarding hernias and hernia repair. This page provides information about hernias and hernia repair so that you can make informed decisions about your health care. Keep in mind, some hernias can cause serious health complications, so if you think you may have one, it is important to see your doctor for a complete medical evaluation. In the United States about 800,000 people per year undergo surgery to repair inguinal hernias (also called groin hernias) and another 500,000 undergo surgery to repair ventral hernias (abdominal hernias not in the groin area). While it's difficult to predict when and where a hernia will occur, the lifetime risk of inguinal hernia for men is 27%. Direct inguinal hernias typically occur in men over 40. Men may also experience any type of ventral abdominal hernia, including incisional, epigastric, and umbilical. Hernias occur less frequently in women, with the lifetime risk of inguinal hernia in women being 3%. Women are at greater risk than men for femoral hernias, or may require surgical repair for ventral abdominal hernias. One type of ventral hernia, the umbilical hernia, can occur in infants and children. 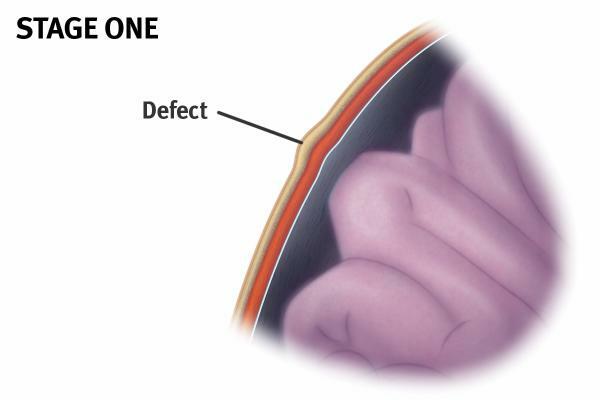 This can be the result of an abdominal wall defect that is present at birth. Children can also get an indirect inguinal hernia, causing a bulge that can be seen and felt. The most typical sign of a hernia is a bulge under your skin in the groin or abdomen. You may also feel pain when you lift, cough or strain. This common condition affects men, women and children of all ages. The good news is, hernias are highly treatable with surgery and innovative hernia repair products from Gore. Gore Medical Products are designed to work in harmony with your body's own tissues, helping to reduce complications following surgery. Additionally, many Gore products are ideal for use in laparoscopic procedures, which offer the benefits of less pain, reduced hernia recurrence, and quicker recovery time. Best of all, after successful treatment, you're free to get back to your regular activities and lifestyle. The abdominal lining bulges out through a weak area and begins to form a hernia sac. 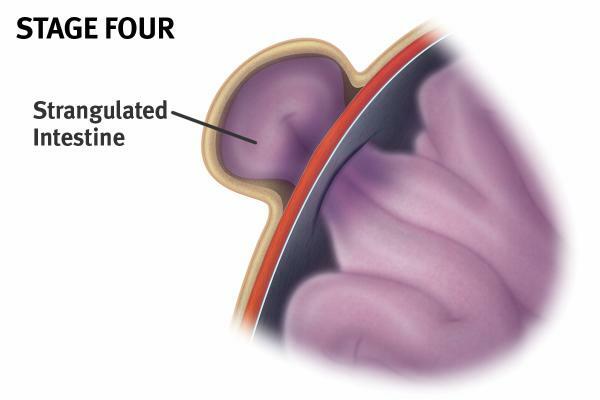 The sac may contain fat, intestine, or other tissues. At this point the hernia may or may not cause a visible bulge. 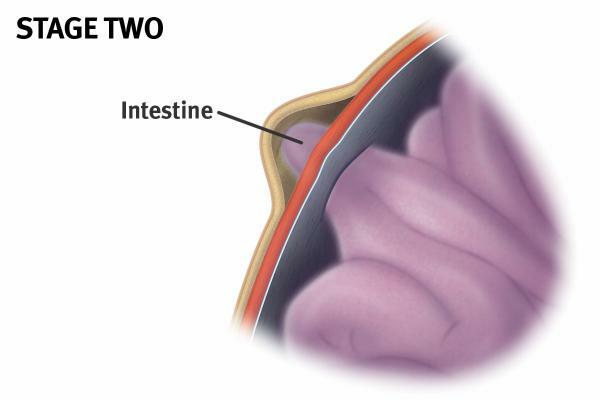 As the intestine pushes further into the sac, it forms a visible bulge. The bulge may flatten when you lie down or push against it. This is called a reducible hernia and does not cause any immediate danger. The sac containing the intestine may become trapped (incarcerated). If this happens, you won't be able to flatten the bulge. You may also have pain. Prompt treatment may be needed. cause severe pain and block the intestine. Emergency surgery is needed to relieve the blockage. Hernias generally grow larger due to pressure on them, such as a loop of your intestine or fatty tissue pushing into the weak abdominal tissue or tear. The result is a sac that forms in the abdominal wall. You may or may not see a bulge at this point. As more abdominal contents push into the sac, a bulge will appear. Sometimes the bulge can be flattened out by lying down or pushing against it. Though a hernia at this stage - known as a reducible hernia - is not an emergency situation, you will likely still need surgery to repair it. 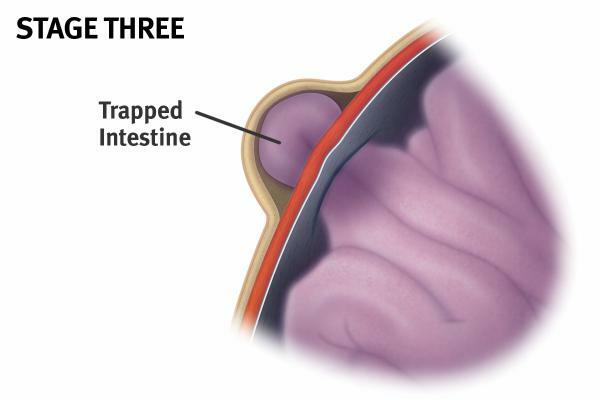 If the intestine gets trapped, or is non-reducible, it is called an incarcerated hernia, and can be quite painful. The bulge cannot ordinarily be flattened out and immediate surgery may be needed. A hernia that becomes tightly trapped, or strangulated, loses blood supply, blocks intestinal flow, and requires emergency surgery. Unfortunately, a hernia won't go away on its own. In fact, hernias typically get worse over time, making hernia repair surgery the standard of care. Most people with hernias have a common set of signs and symptoms. The questions below can help you determine if you have a hernia. They are not intended to be a substitute for professional medical advice, diagnosis, or treatment. Only a physician or other qualified health provider can diagnose and treat a hernia. Most hernias develop in the abdominal wall, which runs from just below your breastbone down into your groin. This wall is similar to the rubber on a tire: it surrounds and protects your organs the same way a tire surrounds and protects the air-filled tube inside of it. 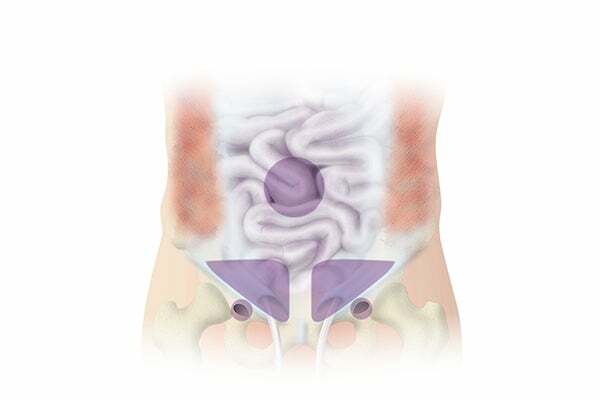 There are two main categories of hernias, named according to where they occur on the body. Within each of these categories, there are different types of hernias. This type of hernia occurs in the weak muscle next to the opening of the inguinal canal in the groin area. Direct hernias typically occur in men over 40, and may result from aging or injury. Indirect Inguinal Hernia – image: indirect-inquinal-hernia As the most common type of hernia in men, an indirect hernia occurs when a loop of intestine and/or fat presses into or through the inguinal canal in the groin area. This area may be weak at birth, allowing hernias to form later in life. Both men and women can get this type of hernia. This hernia is more common in women, who may get it as a result of a weakness in the femoral canal area of the groin. With abdominal surgery comes the risk of an incisional hernia. This type of hernia bulges through the scar from a past surgery, and can occur anywhere on the abdomen months or years after surgery. This hernia is seen in children and adults of both sexes in the umbilical ring that surrounds the navel. It may be caused by a defect that is present at birth, or may occur over time due to obesity, excessive coughing, or pregnancy. An epigastric hernia pushes through the abdominal wall between your lower breastbone and navel. Both men and women can get this type of hernia, which is usually the result of a weakness present at birth combined with intra-abdominal pressure along the midline. Your doctor may use other terms to describe your hernia. If you have hernias on both sides of your groin, these are known as bilateral hernias. If your hernia occurs in the same spot as a previous hernia repair, it is called a recurrent hernia. The goal of surgery is to repair the weak tissue in your abdominal wall so that intestine and other tissue can't push through it again. Generally, the earlier the repair, the smaller the hernia, and the less trauma from surgery. Typically, a more rapid recovery is experienced with smaller hernias. Therefore, it may be beneficial to seek medical attention sooner rather than later. Once your hernia has been successfully repaired and you have recovered from surgery, you will be able to return to your regular activities. Depending on the location and severity of your abdominal hernia, as well as your medical history, your doctor will recommend either open or laparoscopic surgery. Within each surgical option there are different hernia repair techniques. The following information will help you understand these hernia repair options. Your doctor makes an incision in your abdomen where the hernia is located. Intestine or tissue inside the hernia sac is placed back into the abdominal cavity. "Primary repair" - This repair involves sewing the abdominal wall tissues back together with sutures, such as GORE-TEX® Suture. The skin incision is closed with stitches, staples, surgical tape, or special glue. * Klinge U, Conze J, Krones CJ, Schumpelick V. Incisional hernia: open techniques. World Journal of Surgery 2005;29(9):1066-1072. Your doctor makes several small incisions (usually three to six) in the abdominal wall surrounding the hernia. Using the surgical instruments, a "patch repair" is performed (See description in Open Surgery, above). The gas is released and the skin incisions are closed. Laparoscopic ventral hernia repair is typically performed under general anesthesia, and many are same-day procedures. Laparoscopic ventral hernia surgery offers potential benefits such as quicker recovery time, decreased pain, lower infection rate, reduced hernia recurrences, and fewer complications. Whether you have open surgery or laparoscopic surgery, medical studies have shown that a patch repair is the most effective approach in the majority of ventral hernia cases. Depending on the location and severity of your groin hernia, as well as your medical history, your doctor will recommend either open or laparoscopic surgery. Within each surgical option are different hernia repair techniques. The following information will help you understand these hernia repair options. Your doctor makes an incision on the same side as the hernia, at an angle just above the crease where the abdomen meets the thigh. This can be done with local epidural or general anesthesia. Intestine or other tissue inside the hernia sac is placed back into the abdominal cavity. The excess sac may be tied off or removed. "Primary repair" - Also known as a "sutured repair", this repair involves sewing the abdominal wall tissues back together with sutures, such as GORE-TEX® Suture. "Patch repair or tension free repair" - A patch is attached over the weak area around the hernia in front of the muscles. Over time, your body's tissue grows naturally into the patch to make a strong repair. 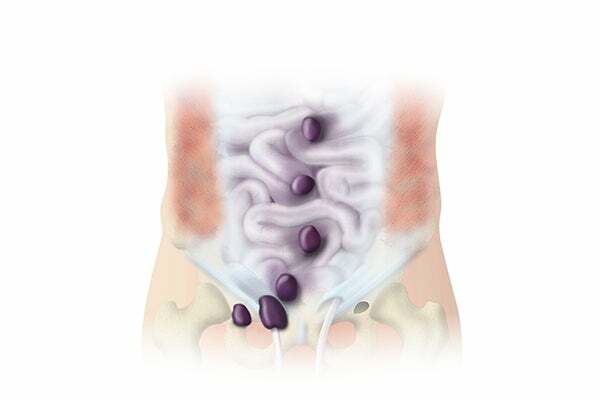 "Plug and patch repair" - A space-filling plug, such as the GORE® BIO-A® Hernia Plug, is placed inside the inguinal hernia to reinforce and support the weak tissue. A patch is then attached over the area. The GORE® BIO-A® Hernia Plug is the only hernia plug that is 100% bioabsorbable and is designed to reduce complications associated with permanent hernia plugs. Your doctor makes several small incisions (usually three to six) in the abdominal wall around the hernia. Your abdomen is inflated with carbon dioxide gas, surgical instruments and a laparoscope (special camera) are inserted through the incisions into the abdomen. Surgical instruments are inserted through the incisions into the abdomen. The hernia is repaired using a "patch repair" technique (See description in Open Surgery, above). In this repair, however, the patch is placed behind the muscles. Most laparoscopic surgeries are same-day procedures done under general anesthesia. Because only small incisions are required, laparoscopic surgery offers quicker recovery time, decreased pain, reduced recurrence of hernia, and fewer complications. Review your medical and surgical history. Discuss medications, diet, and herbal supplements you are taking. Perform lab tests, if needed, such as blood work and x-rays. Perform additional testing, if needed, such as pulmonary or cardiac tests. Your doctor will also talk with you about whether you are having open surgery or laparoscopic surgery, along with the benefits and risks of each. You may be asked to stop taking aspirin, products that contain aspirin, or certain blood thinner medications. Some diet and herbal supplements must be stopped two weeks prior to surgery. Check with your doctor about which medications can be taken the morning of surgery. If you are a smoker, try to quit or reduce your smoking as much as possible. Arrange for someone to take you to the hospital the day of surgery, and home afterwards. You may want to arrange for someone to stay with you for a few days following surgery, especially if you are having open surgery. Your doctor may ask you to drink a laxative to cleanse your intestines. Your doctor may tell you not to eat after a certain time, and to drink only clear liquids until midnight before the surgery. Pack an overnight bag if you are staying in the hospital. Leave valuables such as rings and watches at home. Wear loose clothing to go home and for several days thereafter. When you return home after hernia surgery, it will take several days to recover from laparoscopic surgery and possibly longer if you have had open surgery. Below are ways you can help yourself feel better and get back to your normal routine. To help you get the information you need about your hernia and your treatment options, Gore has developed this list of questions to ask your doctor. Be sure to bring this form to your next appointment and write down the doctor's answers in the space provided. This website is not intended to be a substitute for professional medical advice, diagnosis, or treatment. Only a physician or other qualified health provider can diagnose and treat a hernia.